By the time I got to college, I took Algebra every time I needed to satisfy a math requirement and understanding as little as during my previous attempts. School often made me feel stupid, yet I also realized at a very young age that school was a cosmic farce I would somehow overcome. When this twenty-two year-old halfway through my 7 ¬Ω year undergraduate studies, exited a taxi on the MIT campus, a group of people greeted me with, ‚ÄúCome on. Join us for dinner!‚Äù One of my dinner companions was Dr. Cynthia Solomon, now an irreplaceable member of the Constructing Modern Knowledge faculty. Cynthia Solomon is a giant in our field despite her lack of recognition and absence from the lists of important edtech folks. That‚Äôs a real shame, especially when women and minorities are so underrepresented in our field. I am honored to have known Cynthia for twenty-five years and am deeply indebted to her for her participation in Constructing Modern Knowledge for the third consecutive year. So, who is Cynthia Solomon. She‚Äôs a computer scientist, educator and the inventor of the Logo programming language for children. That‚Äôs right, Cynthia Solomon, Wally Feurzig and Seymour Papert are responsible for creating Logo back in 1968. 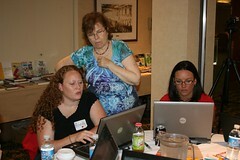 For the next two decades, Cynthia was engaged in much of the foundational research on children constructing knowledge with computers. Check out the paper, Twenty Things to Do with a Computer, that Cynthia and Seymour published in 1971. How does what your school does with computers thirty-nine years later measure up? Long associated with the MIT Artificial Intelligence and Media Labs, Dr. Solomon went on to lead the Atari Cambridge Research Laboratory in the 1980s. Alan Kay led the Atari Lab on the West Coast. (Check out the amazing historic videos she has assembled from that period) After that she was a founder of Logo Computer Systems, Inc. and earned a doctorate in education from Harvard. Until just a few years ago, Cynthia was a full-time school computer teacher. Solomon‚Äôs doctoral dissertation is the basis for the seminal book, Computer Environments for Children: A Reflection on Theories of Learning and Education. If you haven‚Äôt read it, you should. 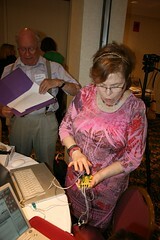 She is also coauthor with Allison Druin of the book, Designing Multimedia Environments for Children. In the late eighties I organized a distinguished speakers series for NJ school leaders and Cynthia Solomon was the first person I hired. Since then we‚Äôve worked together with the MIT Media Lab Future of Learning Goup in Mexico City and at the One Laptop Per Child Foundation. One of life’s great gifts is having the privilege to meet and get to know extraordinarily smart and talented folks like Cynthia Solomon. What a pleasure it was to watch Cynthia, Deborah Meier and Lella Gandini discuss at last year’s CMK. Through Cynthia, I‚Äôve met people like Marvin Minsky (who led fireside chats the past two CMKs) and Stephen Wolfram. Cynthia seems to know all of the smartest scientists and mathematicians of the past half-century. Now, participants in Constructing Modern Knowledge get to know HER. My greatest joy comes from creating opportunities for educators to learn from and interact with smart, talented and innovative people. That‚Äôs why Cynthia Solomon is part of the remarkable Constructing Modern Knowledge faculty and why you should attend. 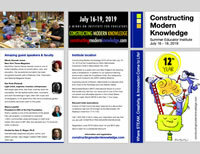 The Constructing Modern Knowledge faculty also includes Deborah Meier, Alfie Kohn, Dr. James Loewen, Peter Reynolds, Briann Silverman, John Stetson, Sylvia Martinez & Dr. Gary Stager. * My Ph.D. in science and mathematics education is the best revenge.